Our attorneys are dedicated to assertively representing you in your accident or personal injury case in an effort to reach the settlement or verdict you deserve. The attorneys at the Law Offices of P. Kent Eichelzer III have over 16 years of experience handling cases involving truck, car, and motorcycle accidents. Are you seeking compensation for your Personal Injury Case in Woodstock, Georgia? The Law Offices of P. Kent Eichelzer III are ready to help you with your case today! Let the personal injury lawyers at the Law Offices of P. Kent Eichelzer III help you today. We have over 20 years of experience and specialize in Accident & Personal injury law, as well as personal injury, truck accidents, insurance bad faith, medical malpractice, wrongful death, and more. We know the ins and outs of insurance companies, which gives our clients an advantage. As your most trusted personal injury lawyer in the greater Atlanta area, our firm will provide you the peace of mind and comfort to guide you through any personal injury case. You may only get one chance to win your personal injury case and you need the right personal injury law team at your side to do so. Whether the personal injury involves you, a loved one, or a friend, the Law Offices of P. Kent Eichelzer III are here to be your legal team. Settling for unexperienced legal council will only lengthen and exacerbate the already arduous road ahead. By choosing the Law Offices of P. Kent Eichelzer III, you will ensure that your personal injury attorneys are there for you and your well-being and will help find the best solutioned resolve on your behalf. We service the entire metro-Atlanta area with offices convenient to Woodstock, GA and Marietta, GA. 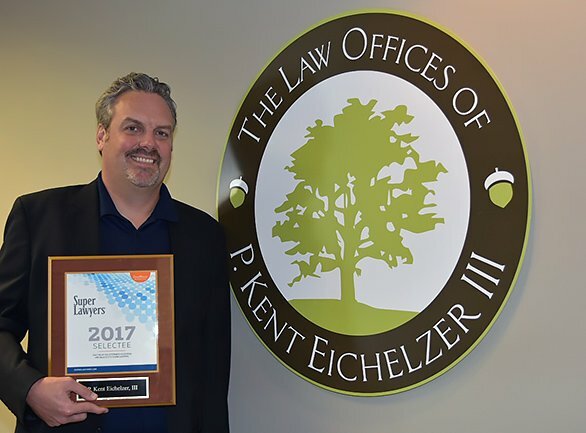 The Law Office of P. Kent Eichelzer III is uniquely qualified and experienced to take on any type of accident or personal injury case. Our attorneys are dedicated to assertively representing our clients in an effort to reach the settlement or verdict that he or she deserves. Client satisfaction is paramount to the success of this firm. Team up with attorney P. Kent Eichelzer III for the quality and skilled representation necessary to achieve the help you deserve in your case. Don’t wait another minute; contact us today for a free consultation.